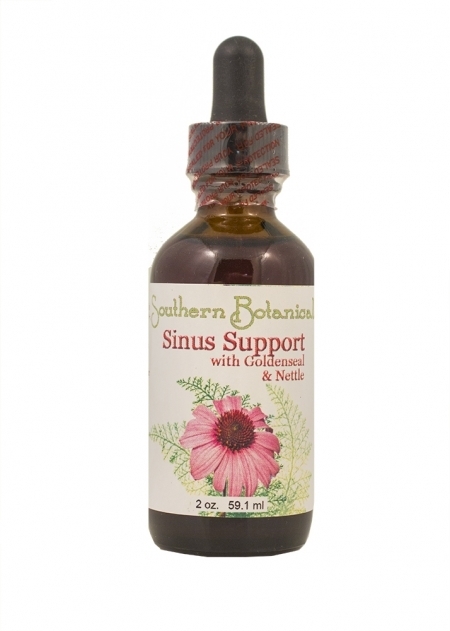 The herbs in our Sinus Support Concentrate (Formally Sinus and Allergy) with Goldenseal & Nettle are combined to support sinus tissue health. Helps with inflammation of sinuses, congestion, watery eyes, runny & stuffy noses and sinus irritability. Get to the bottom of it by expelling materials from the respiratory system. These herbs support healthy sinus, lung and throat tissue. Ingredients (*Organic, +Wildcrafted): Echinacea Angustifolia Root*, Goldenseal Root+, Lobelia*, Eyebright+, Horseradish Root*, Nettle Leaf+, Yarrow+, Kola Nut+ and Pepperment Oil* in a base of distilled water and certified organic GMO-free alcohol. Lobelia - An excellent expectorant, which helps bring up mucus stuck in the lungs. Also, can aid anyone wishing to stop smoking, purging nicotine. Echinacea Root - It stimulates the development of white blood cells in the immune system, which in turn consume invading organisms that infect the body. Goldenseal Root - It is used in combination with echinacea for support in the respiratory system tissues. Goldenseal root has a strong anti-bacterial, anti-viral, and anti-fungal properties. A long-time herbal remedy. Eyebright Herb - This natural herb supports healthy mucus menbranes in the nose and sinuses. Horseradish Root - It helps reduce congestion clearing the sinuses and nasal passages. Horseradish has astringent properties allowing it to reduce swelling in mucus membranes. Horseradish has high levels of sulfur that create an antibiotic effect. Nettle Seed - It naturally inhibits your body's production of histamines. When used in combination with Eyebright, it considered one of the most effective herbs for allergic reactions in the respiratory system. It soothes inflamed and irritated issues and may improve immunity. Yarrow - It has a tonifying and soothing effect on mucus membranes - nose, throat, sinuses and lungs. Peppermint Oil - It reduces sinus and chest congestion. It acts to thin the mucus and break up phlegm.